Thomas Smidmore was born in c1806. He was the illegitimate son of Mary Gough (or Goff), an illiterate Irish-born convict. Mary Gough arrived to Australia per the Tellicherry in 1804. It is likely that Thomas Smidmore was born to Mary sometime after her arrival to Sydney, after August 1806. Thomas’s father is unknown but there is a posibility that he was a naval officer or an officer in the guard on the Tellicherry. Another son, Robert, was born to Mary in c1808. Unlike most female prisoners, it seems that Mary Gough had some resources or support since in the muster of 1806 she was shown as having a ticket of leave but was not being supported by the government stores. It is possible that her ‘protector’ left with his regiment in 1810 following the arrival of Governor Lachlan Macquarie. It is also possible that young Thomas Smidmore returned to England for his education and then came back to NSW in his 20s. 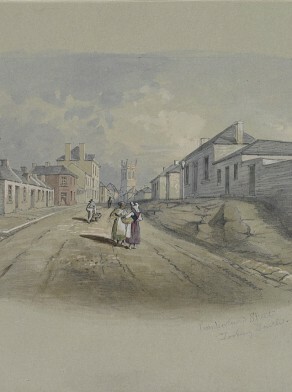 Mary Gough lived with a number of male partners including Robert Murray (possibly the father of son Robert) and the 1811 and 1814 musters show Mary living with a man called Williams. In 1827 she married Thomas Cooper (per Anne 2), a 60 year old ex-convict blacksmith who operated a farrier’s business in George Street. When Mary died in 1846 she left 20,000 pounds in her will. Thomas Smidmore was married three times; all his wives were named Mary. His wives were Mary Galloway (nee Watson) (1831), Mary Cullen (1835) and Mary Curtin (1849). Smidmore fathered 13 children although not all of survived infancy. He died at St Peters on 7 January 1861, aged 54, and was buried in Devonshire Street Cemetery before being transferred to the family’s box tomb at the Old Catholic Mortuary at Rookwood. Thomas Smidmore eschewed his convict heritage to become a prominent member of Sydney society in the mid-19th century. One of his first business ventures was a Staffordshire pottery warehouse on George Street, which he ran in the 1820s and 30s. He later became a successful publican. From 1833 to 1835, Thomas Smidmore was the licensee of the Crown and Thistle Hotel in George Street. In 1837 he had the Loggerheads on the corner of Clarence and Market Streets and from 1836 to 1842 he was the publican of the Union Inn in King Street. Smidmore was a proprietor of the Australasian Chronicle in June 1844. In about 1830 he built 12 terrace houses in Cumberland Street at The Rocks which passed to his wife on his death. In 1840 he bought Lot 1 of the East Balmain subdivision in Paul Street. In 1841 he held land in Frankfort and Sussex streets and in 1851 he was a freeholder of Bathurst Street East. In 1861, he had a residence called Silver Hill on Cook’s River Road. Smidmore Street in Marrickville was named for him. In 1844, Smidmore was a member of the Committee of the Benevolent Society. Thomas Smidmore (c1806-61) was a foundation councillor for Brisbane Ward on the City of Sydney Council from 1 November 1842 through to 31 October 1850. Information supplied by Norma Sheedy, Natatlie Baig and Teresa Smidmore.